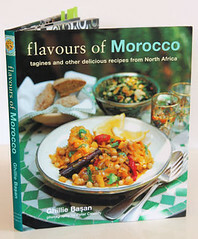 I was recently sent a book called Flavours of Morocco by Ghillie Basan to review. It is the kind of book that makes you long for warm sunny days, days when you can experiment with spices and fruit in your kitchen. It is full of dishes that ooze with colour and are exotic, sensual and decorative. The first thing that you notice when you open this book, is the vibrant colours bouncing off the pages. You almost get lost in the stunning photographs, they transport you right to the heart of Morocco, to the bustling souks and traditional kitchens. Taken by Peter Cassidy, these are some of the best photos I have seen in a cookbook. Flavours of Morocco is more than a cookery book, there are essays on the art of making couscous, Islam, Ramadan & bread, Berber traditions and the tagine. There are chapters on the basic recipes, kemia & salads, soups, breads & savoury pastries, tagines, k'dras & couscous, grills, pan-fries & roasts, vegetables, side dishes & preserves, and sweet snacks, desserts & drinks. 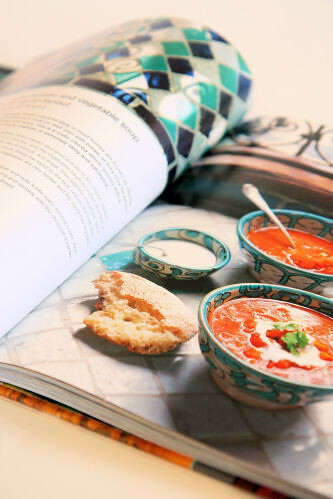 The authentic recipes include spicy aubergine & tomato salad, roasted courgette & apple salad with oranges, classic lamb, chickpea & lentil soup with cumin, Moroccan country bread, and baked pastries with seafood. Tagine recipes include prawn tagine with saffron, ginger & fennel, chicken k'dra with chickpeas, raisins & red peppers, and Marrakchi haricot bean tagine. Many recipes use dried fruit and nuts, and there are some classic sweet treats in the last chapter - I have my eye on a fabulous looking watermelon salad with rosewater & lemon balm. This book would be perfect for the slightly more adventurous cook, who loves cooking with deep flavours and spices. There is a little introduction with every recipe, and almost all of the ingredients can be found in British supermarkets. 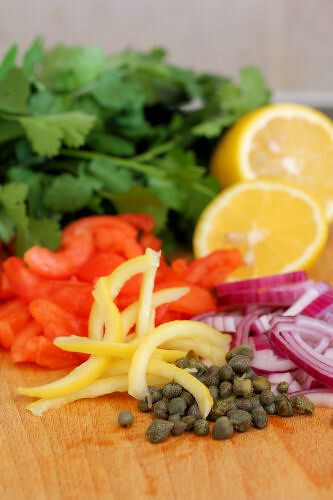 I chose to make a simple colourful salad, bursting with taste sensations. 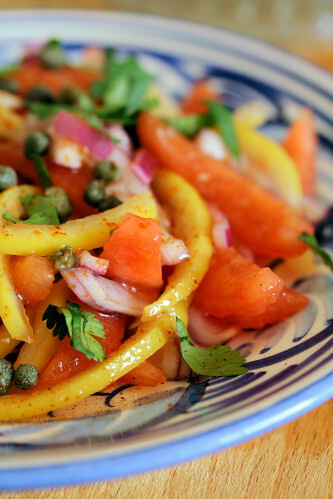 Put the prepared tomatoes, sliced red onion and preserved lemon strips into a bowl. Add the olive oil and fresh lemon juice, mix well. Season with salt and pepper and put aside until ready to serve. 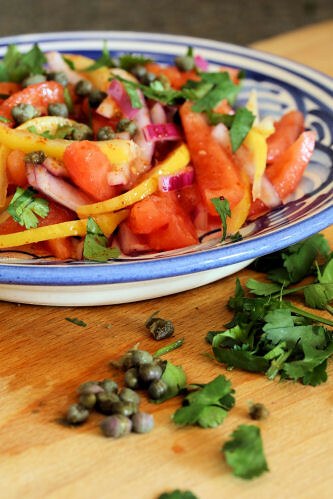 Just before serving, add the capers and herbs to the tomato mixture and sprinkle the paprika over the top. The book can be bought directly from Ryland Peters & Small or from Amazon. Oh wow, that looks fab! I have some preserved lemons ready to try this. Thanks! The photos I see so far truly are extraordinary Nic..but then so are yours. What a lovely Summer's salad, I say! I read the word lemon and my mouth puckers up. 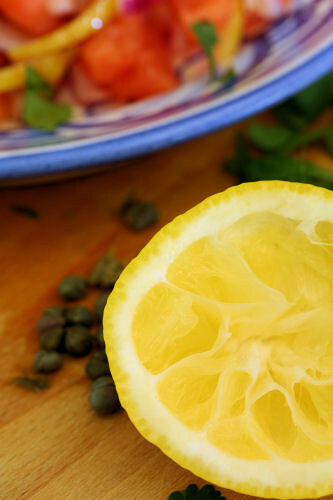 preserved lemon is an outstanding ingredient that adds so much flavor yet is still so subtle. your salad rocks, nic! This is a recipe I wish I would've stumbled upon the last time I tried preserving lemons. Mostly, I used them in seafood dishes and soups; never thought of using preserved lemons in salads. I love North African food, we had a great restaurant near us in Shepherds Bush which did the most amazing tagines. I will look out for this book. That cookbook sounds beautiful. I have to try to make preserved lemons. I am always afraid that it would not turn out good. Many thanks for all your comments, you guys are the best! A Summer salad is calling - These are my kind of flavours.